Michael Crichton, the bestselling author behind the fictional world of Jurassic Park, died today at the age of 66 after a battle with cancer that he hid from the public eye. 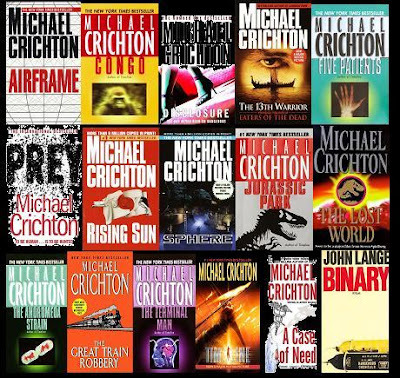 Michael Crichton was one of my favourite authors of all time. He had a unique way of writing science fiction, which was to make it very grounded and realistic, typically taking very high-tech or futuristic subjects and setting them in the present, carefully building his stories in a very believable way. Never afraid to create controversy, he faced the wrath of feminists after his novel 'Disclosure' covered sexual harassment from a man's perspective, and suffered widespread nasty attacks from the dumbest of 'liberals' after his novel 'State of fear' questioned the fear-mongering around the issue of global warming. My favourite of his novels were: The great train robbery, Sphere, Jurassic Park (much darker, and more thought-provoking than the film), and Rising Sun. He also wrote an autobiographical book called 'Travels', which is superb.